The industry’s most innovative and productive line of surface preparation equipment, including surface planers, single and dual head surface grinders, random crack saws, floor covering strippers and pneumatically powered demolition tools. Choose from electric, pneumatic and gasoline power sources along with a wide variety of job specific attachments and accessories. NEW! 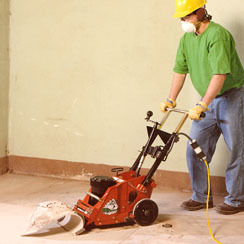 Check out our non-hazardous location VS220 DUST-COLLECT-R® SYSTEM product addition. The best just got better!